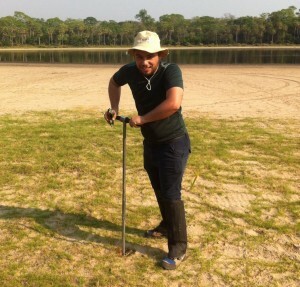 ECH Alex Brito, an undergrad student at the Federal University of Sao Paulo (UNIFESP), is boring a hole to install monitoring wells as part of a project to characterize the groundwater and surface water interaction in the Pantanal region, Brazil. More info can be found at http://soloeagua-unifesp.webs.com. Photo: Juliana Freitas.